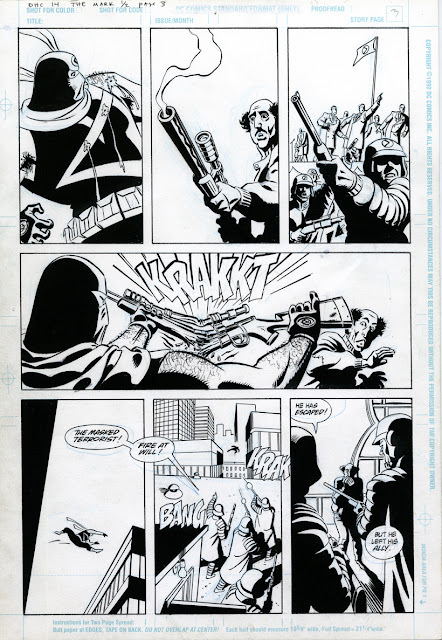 When I got the assignment to illustrate the re-launch of “The Mark” for Dark Horse Comics in 1993, I was coming off my second year of storyboarding on the nascent “Batman” series for Warner Brothers; I had spent the summer of 1992 drawing “Batman Adventures” 4-6 for DC Comics, imitating the style of the animated cartoon series. At this time, in the early 90’s, Image Comics were king of the industry; suddenly everything had to look like an Image comic. I loathed that style of comics; I worshipped at the altar of Alex Toth, the polar opposite of the Image style. I think the reason Bob Schreck (editor of “The Mark” re-launch) wanted me precisely for that reason; he wanted to go counter to the prevailing industry zeit-geist. This is page #3 from Dark Horse Comics #14, “The Mark: Taking Back the Streets”, written by Mike Barr, drawn by Brad Rader, published in November, 1993.